With Abbot's Lodge duly ticked off, we headed back over the road to Sibton Church (consult Simon Knott) where I'd parked the car. Not yet 10:30am, a long line of folk weaved in an suitably serpentine fashion along the path, all keen for that day's jumble sale. Five minutes later, we too wandered in to browse Brian Cant's bric-a-brac. My mum suggested that, before nosing around, we should partake of a cuppa. Waiting for a kettle to boil, smalltalk ensued with one of the good ladies. Curious to know what had brought us there, we explained about the ongoing quest to track down all crinkle-crankle walls in Suffolk. "Oh," she said, "I've got one of those." You're having me on, surely, especially since that would be the 100th wall? Mais non. A week later and we're in Peasenhall standing to the rear of Meadow House, a late C16 dwelling that was originally three cottages. No mention of it in the Grade II listing description but, true to her word, there is Jenny's wall with its gentle twists and turns. Modest in both height and length, it's relatively modern, especially compared with the ancient house behind it. Wonder who built it? As always, big thanks to the owner Jenny (and husband) for their unquestioning hospitality. 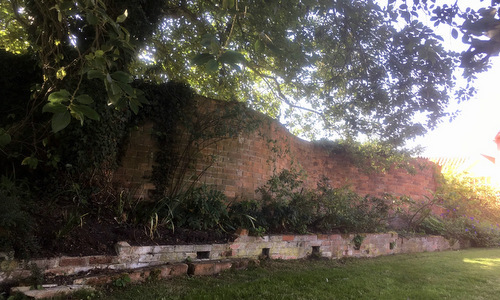 Hat tip to Karen Sparkes who, back in August 2017, asked if I knew about the wall at Wissett Hall, "a spectacular specimen". No, I did not, I replied, observing that said hall was on the market for a cool £2.5m. There in the window of Savills on Princes Street hung an advert for "this beautiful country hall with parkland and a lake." No progress until a year or so later when I got to work with Mr. Google who, after some wrangling, pointed me towards the current owner. Via his son, managed to speak to Colin who listened patiently before saying yes, come visit. Be best, he said, if you liaise with Paul The Gardener. Which I did, arranging to meet there, NW of Halesworth, on a balmy October afternoon. Up the driveway we motored, my mum and me, parking by the Grade II listed property. 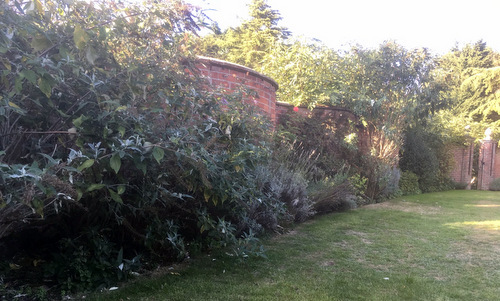 Here was Paul to walk us through to the rather fine walled garden, the western edge comprising a fine crinkle-crankle with gateway, the odd birdbox, bits of trellis and quite a bit of greenery. Most inviting swimming-pool glistened in the sun. Paul proved incredibly generous with his time and knowledge as we walked the lawns in the autumnal heat, a pretty decent way to spend an afernoon. Salt of the earth, that fella. And thanks to Colin too, obviously.